1.1 UP new ration card list name search 2019? 1.2 How to search your name in UP new ration card NFSA eligibility list? Here, we have shared the complete procedure to check NFSA eligibility list from the online portal of Dept. of Food and Logistics, UP. Through this, applicants can easily check their names in the UP APL/BPL ration card list. UP new ration card list name search 2019? At the first step, you have to visit the official portal of the Department of Food and Logistics, Govt. of UP i.e. www.fcs.up.gov.in. You can also open the direct link shared below in this page. Now on the homepage of the website, you have to open the “NFSA eligibility list” provided on the right side of the webpage as shown in the picture. On opening the link, a list of all the district of UP will appear. You have to search your district and have to click on the name of the respective district. Here, you have to select your area (Rural/Town) and have to click on the name of the area. There will separate list for rural area and urban area as shown in the picture. In this step, you have to search for the name of your ration distributor/shopkeeper (Dukandaar) and have to click on the respective category/type of your ration card such as Antodaya/ Eligible household. Once you will select your distributor the list of all the ration cardholder under that distributor will appear on the screen. Now you can check whether your name is there on the ration list or not. You can search your name in the list. You will then find your ration card no. and other basic details mentioned in front of your name. If your name is in the list, then it confirms that you are eligible for NFSA ration. If you want to check complete detail of your ration card, then you can proceed further by clicking on your “Digitized Ration Card Number.” Option. On clicking your ration card no., you will get complete information about your ration card on your screen. If you wish, you can save or take a screenshot of your digitized ration card details for references. However, this step is completely optional. This is how you can check whether your name is present in UP ration card fresh list 2018 or not. 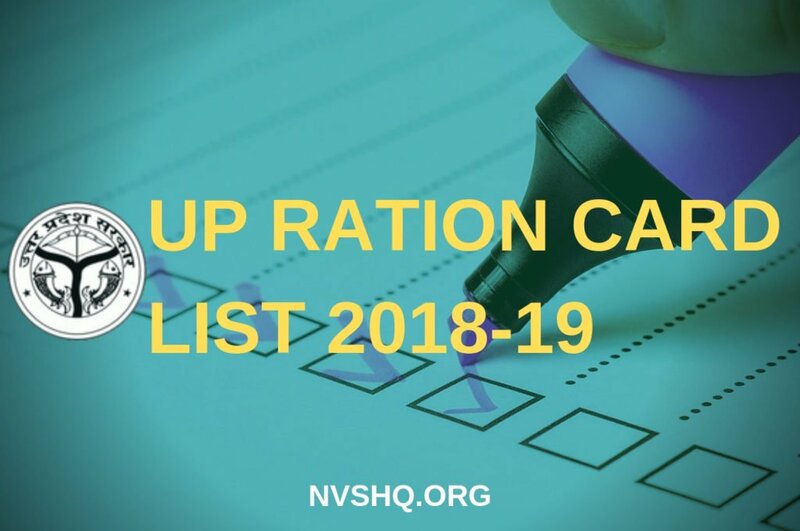 You can also click here to check your name in UP ration card new list 2018-19. How to search your name in UP new ration card NFSA eligibility list? If you wish, you can find your name in the new ration card list directly just by providing all your ration card details. Here you have to enter all the details such as the District, Area, Card type, name, ration card no. etc. in the provided field. It is compulsory to fill All the fields with (*) mark. You must ensure that you enter ration no. and other details correctly. Click on the “Find” button after entering details. If all your details match with the data on the digital ration management system’s database, then you can check your name on the list. What are the Required documents to apply for new UP ration card? Public Distribution System or supply systems are a part of a national scheme in India in which government works for procurement of main food grains such as rice, wheat, sugar and other important supplies such as kerosene and their distribution to the specific population through the ration shops in every state. What is National Food Security Acts? National Food Security Acts is one of the innovative schemes of India associated with PDS system (ration shops) to provide food grains to the one-third population of India in subsidized rates. The NFSA scheme is followed in every state and so in Uttar Pradesh. Is Uttar Pradesh fresh ration card eligible list released? Yes, Uttar Pradesh Department of food and Logistics has recently published the list of applicants who are eligible for the NFSA scheme. People under this scheme include both APL (Above Poverty Line) and BPL (Below Poverty Line) applicants having Antodaya Ann Yojna ration cards and Eligible household cards. People having their names on the list can avail the benefit of buying food grains from the ration shops in subsidized rates on the basis of their ration cards. Where to contact if your name is not in the UP ration card list? Hope you have understood all the information related to ration card list. If you are not able to download the fresh list of eligible person for rasan then you can comment below. Our team member will help you find the list for you and search your name in the fresh candidate list for rasion in UP. Munni devi w,o Udayveer Singh. Apne yaha ke Jan Seva Kendra me sampark kariye.